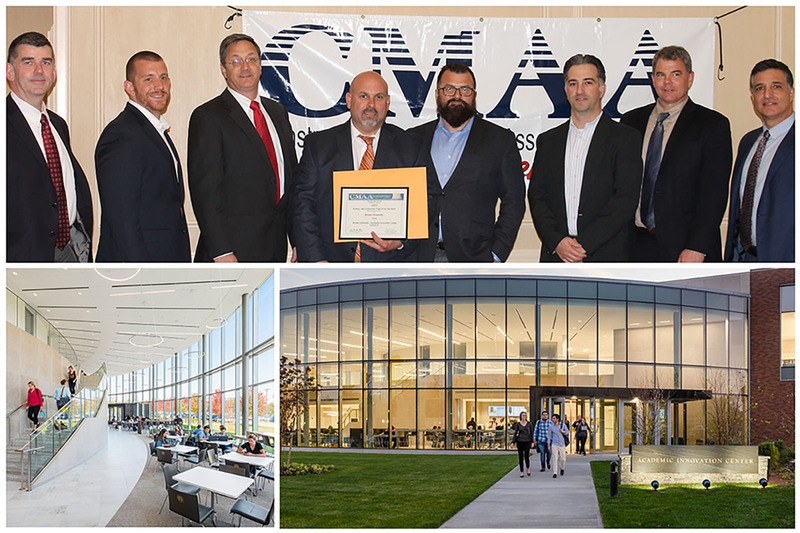 (Boston, MA) – BOND, the Northeast’s premier building, civil, utility and energy construction firm announces it has received a Construction Management Association of America, New England Chapter (CMAA) Project Achievement Award for the Bryant University Academic Innovation Center (AIC) project in Smithfield, Rhode Island. The project won in the New Construction category at the 23rd annual award ceremony on May 3, 2017 at the Omni Parker House, Boston. Bryant University’s AIC is a groundbreaking, state-of-the-art learning facility that embraces the future of experiential education. The 48,290 square-foot building is uniquely designed to inspire creative thinking, problem solving, collaboration and innovative teaching methods. It’s the flagship project of the Bryant Builds Program, a facility plan that has added more than 250,000 square feet of innovative facilities at both the Smithfield campus, as well as Zhuhai, China. Working closely with University stakeholders and design firm EYP, BOND provided preconstruction and construction management services for the project. This included detailed cost estimating, value engineering and procurement strategies to manage cost and schedule. BOND’s preplanning and implementation of technology such as BIM modeling, laser scanning and tablet-based quality control systems ensured each building element was installed to plan. The project was delivered during an aggressive 16-month schedule in time for the fall semester of 2016.